Motorcycle Works will have limited operations from December 17 - January 1. All other orders will be delayed until January 2. Orders to these regions cannot be expedited at this time, and will be processed on January 2. Thank you for giving us the opportunity to earn your business! 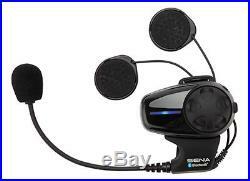 SENA SMH10 Bluetooth Headset/Intercom for Open-Face/Flip-up Helmet (Single Pack). 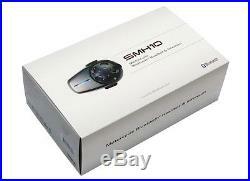 The SMH10 Single Pack contains one complete set of the SMH10 Bluetooth Headset/Intercom. The SMH10 is a Bluetooth 3.0 stereo headset with long-range Bluetooth intercom designed specifically for motorcycles. Thanks to the latest Bluetooth and the advanced digital signal processing technology, the SMH10 offers the best sound quality for both incoming and outgoing sound in its class. Also, the easy-to-access and intuitive button operations make the SMH10 a perfect companion for motorcyclists. Bluetooth intercom up to 900 meters (980 yards) in open terrain. Bluetooth stereo headset for Bluetooth audio devices such as MP3 players. Bluetooth music playback control by AVRCP: Play, pause, track forward and track back. Easy operation by versatile Jog Dial (Patent pending). Sufficient sound level with integrated audio booster. 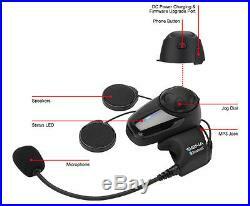 Bluetooth handsfree for Bluetooth mobile phones. Bluetooth headset or stereo headset for Bluetooth GPS navigations. Stereo music by 3.5mm audio cable. Water resistant for use in inclement weather. Crystal clear and natural sound quality. Up to 12 hours talk time, 10 days stand-by time. Can be used while charging on road trips. Individual volume control for each audio source. Working distance (Intercom): Up to 900 meters (980 yards) in open. Operating temperature: -10°C 55°C (14°F 131°F). Headset: 84.1 mm x 56.5 mm x 38.6 mm (3.3 in x 2.2 in x 1.5 in). Clamp unit: 223.8 mm x 85.5 mm x 30.6mm (8.8 in x 3.4 in x 1.2 in). Headset: 60 g (2.11 oz). Clamp unit: 84 g (2.96 oz). Profiles: Headset Profile, Hands-Free Profile (HFP), Advanced Audio Distribution Profile (A2DP), Audio Video Remote Control Profile (AVRCP). Auxiliary audio-in connection via 3.5mm jack. Charging time: 2.5 hours. Certificates: CE, FCC, TELEC, IC. 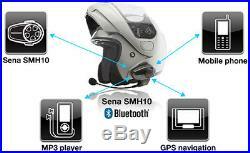 The Sena SMH10 Basic Kit package includes the following items. USB Power & Data Cable. 3.5mm Stereo Audio Jack Cable. Hook and loop Pads for Speakers. NEW in original retail package. We are an authorized SENA dealer. All items in our store are 100% BRAND NEW and genuine. All tags must be attached, retail packaging must be sealed and in brand new condition, and item must not have been worn, used or installed. 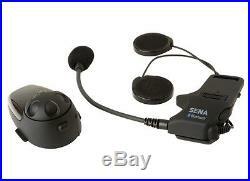 The item "SENA SMH10 Bluetooth Headset/Intercom for Motorcycle Helmet" is in sale since Wednesday, May 13, 2015. This item is in the category "eBay Motors\Parts & Accessories\Motorcycle Accessories\Other Motorcycle Accessories". The seller is "motorcycleworks" and is located in Sparks, Nevada. This item can be shipped worldwide.